The 2016 United States presidential election in Texas was won by Republican Donald Trump and his running mate Mike Pence by a 9% margin over Democrats Hillary Clinton and Tim Kaine, part of the November 8, 2016 General Election. Texas assigns its 38 Electoral College votes to the state's popular vote winner, but two faithless electors chose other candidates, making Texas the only state in 2016 to give Trump fewer than the assigned electoral votes. When the electoral college met on December 19, 2016, only 36 out of the 38 electors voted for Trump for president. Two electors defected, one to Ohio Governor John Kasich, and the other to Congressman Ron Paul. For Vice President, 37 electors voted for Pence, and one for Carly Fiorina. The primary of March 1, 2016 included the Green Party, in addition to the two major parties. Texas was one of the eleven states where Hillary Clinton improved on Barack Obama's performance in 2012. Clinton lost Texas by a smaller margin than any Democrat since 1996 (though Barack Obama got a larger percentage of the vote in 2008), which analysts attributed to ongoing demographic changes, although other analysts cite evidence suggesting the real reason was Trump losing ground with college-educated white voters. Trump's campaign became the tenth Republican campaign in a row to win Texas, beginning with Ronald Reagan's 1980 campaign for presidency. The Texas Democratic Party held their state's primary in concurrence with the other Super Tuesday contests on March 1. Eight candidates appeared on the ballot, Hillary Clinton, Bernie Sanders, dropped-out candidate Martin O'Malley and five minor candidates (Rocky De La Fuente, Willie Wilson, Star Locke, Keith Russell Judd and Calvis Hawes.) The Texas Democratic primary had 251 delegates to the Democratic National Convention; 222 pledged delegates and 29 super delegates. 145 delegates were allocated proportionally based on the results in the state's 31 senatorial districts. The other 77 pledged delegates were allocated proportionally based on the statewide popular vote. February 24, 2016 – Houston, Texas Megyn Kelly hosted a two-hour town hall event on The Kelly File with Kasich, Cruz, Rubio, and Carson in attendance. Trump did not participate in the forum. After the caucus in Nevada, the tenth debate was held at the University of Houston in Houston and broadcast by CNN as its third of four debates, in conjunction with Telemundo. The debate aired five days before 14 states vote on Super Tuesday, March 1. While the debate was to be held in partnership with Telemundo's English-language counterpart NBC, RNC Chairman Reince Priebus announced on October 30, 2015, that it had suspended the partnership in response to CNBC's "bad faith" in handling the October 28, 2015, debate. On January 18, 2016, the RNC announced that CNN would replace NBC News as the main host of the debate, in partnership with Telemundo and Salem Communications (CNN's conservative media partner). The debate was shifted a day earlier at the same time. National Review was disinvited by the Republican National Committee from co-hosting the debate over its criticism of GOP front-runner Donald Trump. On February 19, the criteria for invitation to the debate was announced: in addition to having official statements of candidacy with the Federal Election Commission and accepting the rules of the debate, candidates must have received at least 5% support in one of the first four election contests held in Iowa, New Hampshire, South Carolina, and Nevada. By these criteria, all five remaining candidates, Carson, Cruz, Kasich, Rubio, and Trump, qualified for invitation to the debate. The 155 delegates to the Republican National Convention were allocated in this way. 108 delegates are allocated by congressional district; 3 per district. If a candidate gets over 50% of the vote in a congressional district; they would win all of the district's 3 delegates. If no one had a majority and one candidate had at least 20% of the vote, the candidate winning the plurality would get 2 delegates and the candidate in second place would get 1 delegate. If nobody receives at least 20% of the vote, the top 3 vote-getters each get 1 delegate. There were another 47 at-large delegates. If someone received more than 50% of the vote, they would get all of the at-large delegates. If no one got more than 50% of the vote and there were at least 2 candidates that got over 20% of the vote, the delegates would be allocated proportionally among the candidates receiving more than 20% of the vote. If only one candidate got over 20% of the vote and not a majority, the delegates would be allocated between the candidate that got over 20% of the vote and the candidate who received the 2nd most votes. If no candidate got 20%, they would allocate all of the 47 at-large delegates proportionally. The last time Texas voted for a Democratic candidate was the 1976 Presidential election when Jimmy Carter won 51.14% of the popular vote. Hispanic participation can create a very interesting and unpredictable outcome, especially on the Democratic statewide tickets since they lean heavily Democratic. The Hispanic turnout has increased by approximately 200,000 for each and every presidential election since 2000. The following are final 2016 predictions from various organizations for Texas as of Election Day. The voting age population was 19,307,355, of which 15,101,087 were registered to vote. Turnout was 8,969,226, which is 46.45% of the voting age population and 59.39% of registered voters. Thirteen candidates received write-in votes, of which the large majority (42,366) went to Evan McMullin. 38% 59% Filemon Vela Jr. While he continued the Republican 10-cycle winning streak in Texas, Trump's winning margin was down from Mitt Romney's 16% in 2012 to 8.99%, a 7.01% drop, making 2016 the closest Democrats had come to winning Texas since 1996 (though the Democrats also received a smaller percentage of the vote in Texas in this election than in the 2008 presidential election). 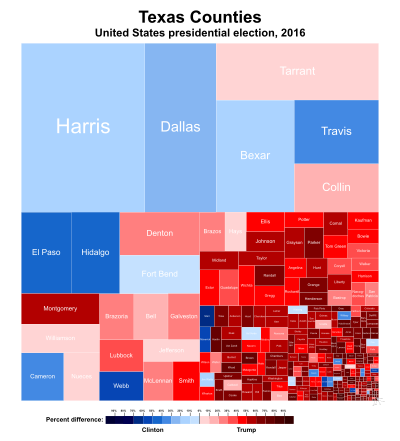 The surge in Democratic votes can partly be attributed to a growing population of Hispanics/Latinos, Trump’s relatively weak performance with college-educated white voters, and the growth of cities and their respective suburbs in the Texas Triangle region, which are heavily populated with both college-educated voters and minorities and thus swung more Democratic compared to 2012. These were Clinton's main sources of votes. She swept the Rio Grande region counties, such as El Paso, Webb, Hidalgo and Cameron as they have sizable Hispanic populations. Clinton also took the highly liberal and fast growing Travis County (Austin), as well as the urban and minority-heavy counties of Bexar (San Antonio), Dallas, and Harris County (Houston), where she turned the historically thin vote margins of previous cycles in the latter into a 12-point lead. Clinton also won suburban Fort Bend County for the first time since Texas native Lyndon B. Johnson in 1964, which was attributed to the county's large immigrant population and negative perception of Trump by female Republican voters. Trump on the other hand narrowly flipped Jefferson County in East Texas, becoming the first Republican since Richard Nixon in 1972 to win the county. Places that had large numbers of young voters in the state were a stronghold for Clinton as well. Texas Lieutenant Governor Dan Patrick suggested that Trump's relatively small margin of victory could have been largely due to many moderate Republican voters who had supported Romney in 2012 staying home. In an interview conducted the morning after the election, Patrick said in reference to these voters, "Had they turned out, he would've been in the low teens". In total, Clinton beat Trump in 27 counties by a total of 883,819 votes, and had the best percentage performance than any other Democrat running statewide. Conversely, Trump, who won 227 of the state's 254 counties, got the smallest percentage of the vote than all other Republicans running in the state. ^ "HISTORICAL ELECTIONS - OFFICIAL RESULTS". elections.sos.state.tx.us. ^ "Vote Swing - 2016 Presidential General Election Data - National". Dave Leip's Atlas of U.S. Presidential Elections. Retrieved October 27, 2018. ^ "Texas Democratic Delegation 2016". www.thegreenpapers.com. Retrieved February 23, 2017. ^ "Race Summary Report: 2016 Democratic Party Primary Election". Texas Secretary of State. March 1, 2016. Retrieved July 14, 2016. ^ "Inside the Beltway: Donald Trump won't participate in Megyn Kelly's Fox News candidate forum". The Washington Times. ^ SPRUNT, BARBARA. "On The Clock: Trump Dominated Debate In Speaking Time". npr.org. NPR. Retrieved February 25, 2016. ^ "Election 2016 - 2016 Republican Presidential Nomination". RealClearPolitics. Retrieved November 13, 2016. ^ "Debate fallout: GOP suspends debate partnership with NBC". Washington Examiner. October 30, 2015. Retrieved October 30, 2015. ^ "RNC CANCELS ONLY DEBATE TO AIR ON SPANISH-LANGUAGE TV". Newsweek.com. Retrieved January 14, 2016. ^ "NBC replaced by CNN for GOP's Super Tuesday debate". CNN Money. Retrieved January 18, 2016. ^ "National Review Kicked Out of GOP Debate After Anti-Trump Stand". Wall Street Journal. January 22, 2016. ^ Watkins, Eli (February 19, 2016). "CNN's Wolf Blitzer will moderate Republican debate in Houston". CNN. Retrieved February 22, 2016. ^ "Texas Republican Delegation 2016". www.thegreenpapers.com. Retrieved February 23, 2017. ^ "Race Summary Report: 2016 Republican Party Primary Election". Texas Secretary of State. March 1, 2016. Retrieved July 14, 2016. ^ "Stein wins in Boston and Worcester". Green Party Watch. March 2, 2016. Retrieved March 5, 2016. ^ "Unofficial results show Stein easily winning Massachusetts Green-Rainbow Party presidential primary". Green Party Watch. March 2, 2015. Retrieved March 5, 2016. ^ "Divided America: Texas Hispanic voting bloc largely untapped". Archived from the original on October 19, 2016. Retrieved October 18, 2016. ^ Tinsleyatinsley, Anna M. (September 10, 2016). "How important is the Hispanic vote in November 2016?". The Star-Telegram. Retrieved November 13, 2016. ^ "Our final map has Clinton winning with 352 electoral votes. Compare your picks with ours". Los Angeles Times. November 6, 2016. Retrieved November 13, 2016. ^ "Road to 270: CNN's general election map - CNNPolitics.com". Cnn.com. November 8, 2016. Retrieved November 13, 2016. ^ "Larry J. Sabato's Crystal Ball » 2016 President". Centerforpolitics.org. November 7, 2016. Retrieved November 13, 2016. ^ Todd, Chuck. "NBC's Final Battleground Map Shows Clinton With a Significant Lead". NBC News. Retrieved November 13, 2016. ^ "ElectoralVote". ElectoralVote. December 31, 2000. Retrieved November 13, 2016. ^ "2016 Election Maps - Battle for White House". RealClearPolitics. Retrieved November 13, 2016. ^ "Electoral Scorecard: Map shifts again in Trump's favor, as Clinton holds edge". Fox News. November 7, 2016. Retrieved November 13, 2016. ^ "Electoral Map 2016: Forecast Who Will Win-Clinton or Trump". Abcnews.go.com. Retrieved November 13, 2016. ^ "Turnout and Voter Registration Figures (1970-current)". www.sos.state.tx.us. Retrieved January 3, 2017. ^ "2016 General Election Results". Retrieved December 23, 2016. ^ "Introducing the 2017 Cook Political Report Partisan Voter Index". The Cook Political Report. ^ Rogers, Mary Beth. "Turning Texas blue? : 3 trends could undo the 20 years of Republican rule Texas has endured since the days of Ann Richards". Salon. Retrieved March 10, 2017. ^ Tribune, The Texas (November 11, 2016). 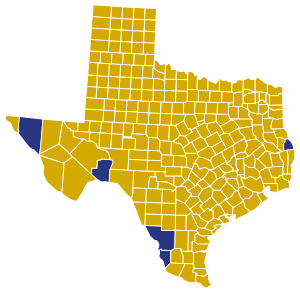 "There's no shading it, Harris County went undeniably blue". The Texas Tribune. Retrieved March 9, 2017. ^ Quinn, Kevin (November 9, 2016). "Political shift in Ft. Bend leans toward Clinton". KTRK-TV. ^ "Texas County Elects Black Woman Sheriff and Votes for Trump". ^ "Trump across Texas, visualized". Houston Chronicle. Retrieved March 9, 2017. ^ Svitek, Patrick (November 9, 2016). "Donald Trump wins Texas, leads Hillary Clinton by 9 points". The Texas Tribune. Retrieved December 25, 2018. ^ Tribune, The Texas (November 11, 2016). 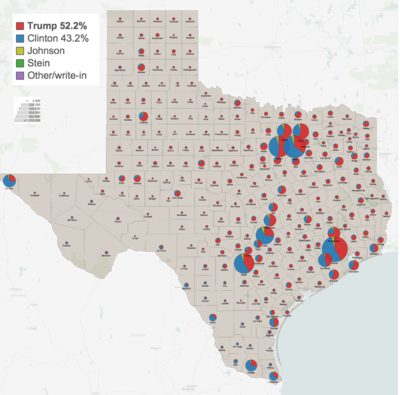 "Analysis: The blue dots in Texas' red political sea". The Texas Tribune. Retrieved March 9, 2017.